At a time when our earliest human ancestors mastered walking upright the heart of our Milky Way galaxy underwent a titanic eruption, driving gases and other material outward at 2 million miles per hour. Now, at least 2 million years later, astronomers are witnessing the aftermath of the explosion: billowing clouds of gas towering about 30,000 light-years above and below the plane of our galaxy. The enormous structure was discovered five years ago as a gamma-ray glow on the sky in the direction of the galactic center. Astronomers have since observed the balloon-like features in X-rays and radio waves, but needed NASA's Hubble Space Telescope to measure for the first time the velocity and composition of the mystery lobes. They now seek to calculate the mass of the material being blown out of our galaxy, which could help determine the cause of the outburst. 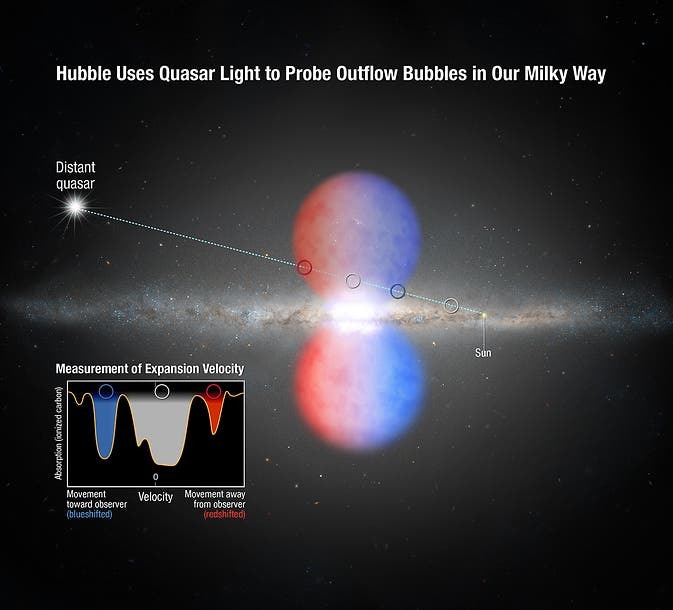 Hubble observations of Milky Way Outflow Bubbles maps the velocity and composition of mysterious lobes expanding from our galaxy. Although astronomers have seen gaseous streams of charged particles blowing from the cores of other galaxies, this is a unique opportunity for a close-up view of our galaxy's own fireworks. "When you look at the centers of other galaxies, the outflows appear much smaller because the galaxies are farther away," said Andrew Fox of the Space Telescope Science Institute in Baltimore, Maryland, lead researcher of the study. "But the outflowing clouds we're seeing are only 25,000 light-years away in our galaxy. We have a front-row seat. We can study the details of these structures. We can look at how big the bubbles are and can measure how much of the sky they are covering." The giant lobes, dubbed Fermi Bubbles, initially were spotted using NASA's Fermi Gamma-ray Space Telescope. The detection of high-energy gamma rays suggested that a violent event in the galaxy's core violently launched energized gas into space. To provide more information about the outflows, Fox used Hubble's Cosmic Origins Spectrograph (COS) to study the ultraviolet light from a distant quasar, a galaxy with a bright active nucleus, that lies behind the base of the northern bubble. Imprinted on that light as it travels through the lobe is unique information about the velocity, composition, and temperature of the expanding gas inside the bubble. Fox's team was able to measure that the gas on the side of the bubble closer to Earth is moving towards us and the gas on the far side is travelling away. COS spectra show that the gas is rushing from the galactic center at roughly 2 million miles an hour, or 3 million kilometers an hour. 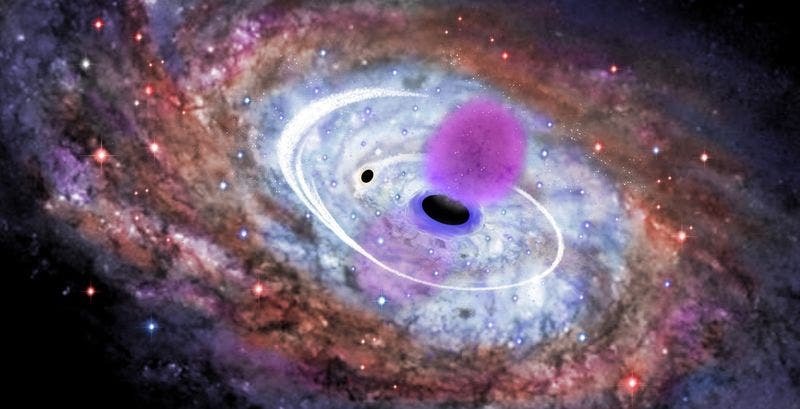 "This is exactly the signature we knew we would get if this was a bipolar outflow," explained Rongmon Bordoloi of the Space Telescope Science Institute, a co-author on the science paper. "This is the closest sightline we have to the Galaxy's center where we can see the bubble being blown outward and energized." The COS observations also measure the composition of the material being swept up in the gaseous cloud. COS detected silicon, carbon, and aluminum, indicating that the gas is enriched in the heavy elements produced inside stars and represents the ancient remnants of star formation. COS measured the temperature of the gas at approximately 17,500 degrees Fahrenheit, which is much cooler than most of the super-hot gas in the outflow, thought to be at about 18 million degrees Fahrenheit. "We are seeing cooler gas, perhaps interstellar gas in our galaxy’s disk, being swept up into that hot outflow," Fox explained. This is the first result in a survey of 20 faraway quasars whose light passes through gas inside or just outside the Fermi Bubbles – like a needle piercing a balloon. An analysis of the full spectrum of the light sample will yield the amount of mass being ejected. The astronomers can then compare the outflow mass with the velocities at various locations in the bubbles to determine the amount of energy needed to drive the outburst and possibly the origin of the explosive event. One possible cause for the outflows is a star-making frenzy near the galactic center that produces supernovas which blow out gas. Another scenario is a star or a group of stars falling onto the Milky Way's super-massive black hole. When that happens, gas superheated by the black hole is ejected deep into space. Because the bubbles are young compared to the age of our galaxy, and believed to be a short-lived phenomenon, the bubbles may be evidence for a repeating event in the Milky Way's history. Whatever the trigger is, it likely occurs episodically, perhaps only when the black hole gobbles up a concentration of material. "It looks like the outflows are a hiccup," Fox said. "There may have been repeated ejections of material that have blown up, and we're catching the latest one. By studying the light from the other quasars in our program, we may be able to detect the ancient remnants of previous outflows." Galactic winds are common in star-forming galaxies, such as M82, which is furiously making stars in its core. "It looks like there's a link between the amount of star formation and whether or not these outflows happen," Fox said. "Although the Milky Way overall currently produces a moderate one to two stars a year, there is a high concentration of star formation close to the core of the galaxy."